Propagating locally source plant species helps maintain biodiversity. As well as sourcing local-provenance plants from community nurseries in the inner west, IWEG volunteers collect seed from the bushcare sites and raise seedlings. 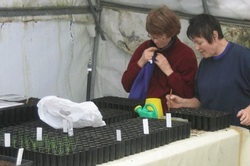 Using seedling trays we can raise thousands of native grass ‘plugs’ for dense grassland planting. The propagation work can be done at homes and the trays distributed to volunteers for raising and nurturing until they are ready to plant. Volunteers have propagated thousands of plants this way. For sites where weed control has been successful, seeds from native grasses can be spread on disturbed ground to aid natural spread of seed and germination. We have planted a variety of species to maintain biodiversity. All these species have different ways of propagation: some from seed; some vegetatively from plant root to stem material; and some from spores (such as ferns). Volunteers can help at the community nurseries, such as Marrickville Community Nursery, and Rozelle Bay Community Nursery. IWEG also provides some seed to Gladesville Community Nursery (also known as Cornucopia Nursery) for propagation, which in turn provides tube stock to IWEG for planting.